This remains my most versatile method of preserving large quantities of mushrooms, especially those requiring rapid or delicate handling, such as Coprinus comatus (Shaggy Mane). Also, washing in water does not hurt the end product, so mushrooms noted for trapping sand and dirt can be thoroughly washed first. 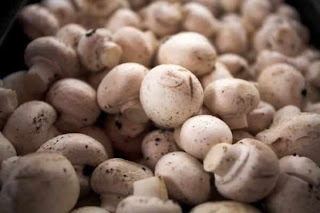 Washed Mushrooms are taken directly from a cold water wash basin or sink where they have been cleaned, washed and are still soaking in the tub of water with a colander or sieve, drained for a moment and plunged directly into a pot of boiling water for 1 to 2 minutes after water re-boils. They are then removed with a sieve or colander and are plunged into old water to stop the cooking process. Once cool, the mushrooms are drained of rinse water and placed in plastic freezer containers. A mass-production line can be set up. blanched product into cold water, while cooling, new raw product into hot blanch liquid, etc. The process becomes very efficient. At the end, cool the blanching water and place into the containers of mushrooms, leaving enough head space so freezing won’t overfill or rupture the containers (usually 1 to 1½ inches is fine for most freezer container shapes. Soups and stews throughout the non-collecting months by simply dropping the entire frozen contents into soup 20 minutes to ½ hour prior to the soup completion time, letting it simmer the last 20-30 minutes. Blanching stops enzymatic action and prevents mushrooms from turning into mush. Washing gets rid of sand and dirt with no adverse effect in the end product. Texture for soup remains good. Very easy to do large amounts of mushrooms in a relatively short time. Very convenient to use, just plop frozen mass directly into soup cooking. Pre-thawing is not necessary or desirable. Flavor preservation is exceptional. Not as high quality a product for uses requiring frying, sauteing, or crisping of mushrooms, but actually can still be done. Very similar to blanching in liquid, except steam instead of liquid is used to blanch. A steamer basket is placed in a boiling water bath such that it remains above the level of the boiling liquid. Mushrooms are steam blanched 2 minutes or so. The mushrooms are then cooled either in a cold water bath and then drained and packed in freezer containers, or the mushrooms are spread directly from the steamer basket onto a cookie sheet sprayed with Pam or vegetable non-stick, spread into a single layer and then frozen on the cookie sheet until fully frozen. They can then be freed from the cookie sheet and placed into freezer bags as individually free mushroom pieces. These can be used in soups, stews, etc., or can be placed frozen directly into an ongoing stir-fry for great results. Do not thaw first. Place a few at a time into cooking stir-fry and keep the temperature up. Soups and stews for frozen water soaked container mushrooms or stir-fries and sauted dishes direct from the bag for free-frozen pieces; also tempura or batter fried used frozen from the bag, batter dipped still frozen and fried immediately. Convenient, more versatility than water blanching. Excellent taste and texture preservation. Somewhat more time-consuming and more complicated than water blanch. Also, does not clean dirt, sand, and grit as well as water blanching, so pre-selecting the cleanest mushrooms works best for this method. Any of the drier textures mushrooms such as Lobster mushrooms, and Man on Horseback (Tricholoma flavovirens) benefit from the saute oils and do this method justice. Slice, chop, or prepare mushroom shape/pieces as preferred. Fry in butter or olive or walnut oil for ant standard fried mushroom dish, stopping the cooking process slightly before normal and allow to cool by transferring mushrooms to cool pie plates, glass or baking dishes, etc. When cool, portion mushrooms into small freezer containers and freeze. To use, simply pop out the portion onto a saute pan with a little of the same oil or butter used to first prepare them. Do not pre-thaw. Best reproduces the texture and taste of a mushroom saute. Easy and convenient. Usually more air exposure inside freezer container; and air is what causes freezer burn, so may not preserve the quality for as long in the freezer as those methods excluding air better such as freezing under broth. Patting mushrooms gently to bottom of container into solid block and then placing some plastic wrap directly on mushrooms before covering with container lid helps some. Thank you very much for this post. I've just started to grow my own mushrooms, and i've been researching for ways to preserve the fruits, so this is a Godsend. Looking forward to the part 2. thanks again! We should take care not only of how to preserve the fresh and beautiful appearance of the product, but also about the preservation of all useful substances. I would like to see here some information on planting. It would be great to make some improvements here.